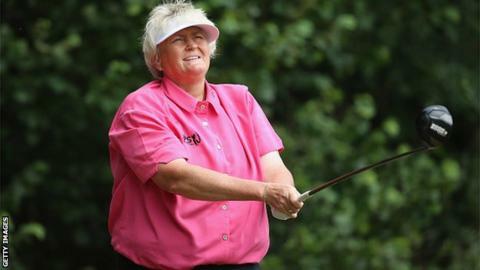 Dame Laura Davies is a former women's world number one who became the first non-American to finish at the top of the money list on the US Tour in 1994. She became a Dame last year and in February was made one of the first female members at the Royal and Ancient Golf Club of St Andrews. The 51-year-old has won 79 events worldwide, including four majors, and competes at the British Women's Open at Turnberry this week. She has also appeared in a record 12 Solheim Cups for Europe, and this year was inducted into the World Golf Hall of Fame at St Andrews. In a BBC interview, Dame Laura discusses her hopes for a Solheim Cup return, her chances at Turnberry and other golfing issues. Do you like to be addressed as Dame? "Just call me Laura. Some people do, some don't. It's lovely, not the sort of thing you use, it's just nice to have it. Some posh people like to call me Dame - my friends aren't posh. "It's been a good year with the R&A, the Hall of Fame and the Dame thing. Things keep happening. It's almost like I should be retired - I've most certainly not retired - but that's the sort of thing that normally happens when you've given up." Will Tiger Woods win another major? "I think he can win again. He's only one round away from getting rid of the gremlins. It's not his swing - I stood on the range behind him at The Open and he was just flushing every shot. But he can't take it to the course yet - and that's pure confidence. "You can never be sure but if I had to put my last pound on whether he will win another major I'd say, yes, every time. "I met him once, very briefly on a first tee in a big pro-am over in Ireland about four or five years ago. He was very nice to me. It's not like I know him but he was very pleasant." "I'm playing well tee to green. If I can make a few putts, I'll be competitive. I don't have targets for individual events - I just want to win. That's what we're all here to do, otherwise there's no point in playing. "I'm trying to get into the Solheim Cup team. There are two more qualifying events - the British Open and then the Swedish Open. "I don't think European captain Carin Koch will pick me unless maybe I get to fifth on the points list. I can't complain if I don't get in because I've had two years to try and qualify and I haven't managed it... yet." Who will win the British Open? "I played there once and missed the cut, but it's a course where I like the holes, and there is no reason why I shouldn't have a good crack at it like I did at Birkdale last year [she finished tied for ninth]. "There's any amount of players that could win it. There are the usual suspects such as Lydia Ko, Inbee Park and Stacy Lewis but no-one is scared to win. Take the young Korean [20-year-old Gee Chun] who won the US Open. No-one had heard of her and now she's won a major." Has coverage of women's golf improved? "It's getting better definitely but still not where we need to be, because we deserve more. The British Open on the BBC is a huge week for us, hopefully people will see that and think it's a good product. "I'm enjoying watching the Women's Ashes. Women are getting a better shake of the stick but professional sport on TV is still a male-dominated world." "St Andrews. The history certainly helps but I love the course. It changes every day with the wind, it is the Home of Golf and it's the best. "The hole that has cost me the most is 17th so I love and hate that, but my favourite is probably the little par-three 11th, along with the Postage Stamp at Royal Troon."